Approximately 800 kyr ago, something changed within the climate system that led to the currently observed cycle of glacial/interglacials. The time interval between glacial terminations, which are referred to as TI (end of the last ice age), TII, TIII, and so on, varies from 84,000 years to 120,000. In 1941 Milutin Milankovich published a paper in which he outlined a mechanism by which the cycle of glacial/interglacial periods is controlled by variations in incoming solar radiation which are determined by small, predictable changes in the Earth's orbit and tilt with respect to the sun. The angle of the Earth's axial tilt (obliquity of the ecliptic ) varies with a period of approximately 41,000 years. The Earth's axis of rotation precesses with a period of roughly 26,000 years. The eccentricity of the Earth's orbit varies with a period of 413,000 years with smaller cycles varying between 95,000 and 125,000 years. The Earth's orbital ellipse precesses in space with a 100,000 year cycle, primarily as a result of interactions with Jupiter and Saturn (this was not studied by Milankovitch). According to the Milankovitch theory, changes in summer insolation in the high-latitude Northern Hemisphere caused glacial cycles through their impact on ice-sheet mass balance. The first experimental support of the orbital forcing hypothesis was in a seminal article by Hays, Imbrie and Shackleton in 1976. It reported the analysis of deep sea sediment cores. It relied on a chronology which was developed by tuning sediment timescales to insolation curves calculated from orbital forcing theory. Its conclusions provided some support for the orbital forcing hypotheses, finding the 41,000 and 26,000 year cycles with the predicted ratio in their relative strengths in the marine sediment record. However, in 1992 Winograd et al. published an analysis of oxygen-18 variations (a temperature proxy) in a 36-centimeter-long core of vein calcite from Devils Hole, Nevada. This influential article challenged the orbital forcing hypothesis. The core yielded an uninterrupted 500,000-year paleotemperature record that closely mimics all major features in the Antarctica ice core (Vostok) record. The chronology was supported by Thorium-230/Uranium-238 and Uranium-234/Uranium-238 dating. 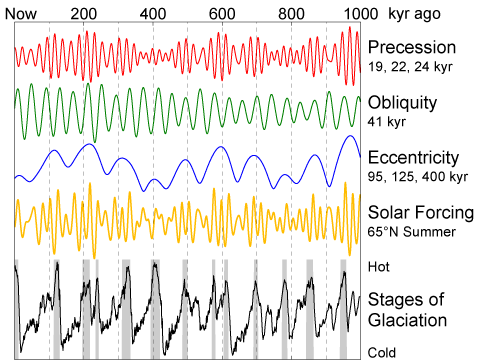 Their analysis concluded that orbitally controlled variations in solar insolation were not a major factor in triggering deglaciations. The key issue was the timing of events at the end of the second glacial period called Termination II (TII). The Devils Hole chronology reported by Winograd et al places the TII inital warming about 10,000 years before the rise in summer insolation calculated from orbital forcing theory. To address this controversy, the reproducibility of the Devils Hole record was tested by reanalyzing the earlier cores from Devils Hole proper and analyzing four newly drilled cores from Devils Hole 2. The previously studied samples had all been collected at substantial depths below the current water table (lower elevations), whereas the new cores from Devils Hole 2 were collected from above the water table (higher elevation). The recent observations including delta-oxygen-18 (a paleotemperature proxy) variations, and the 230Th/238U and 234U/238U compositions and concentrations (used for dating), were all found to be similar to those in the original reports. But it was found that the chronology of the shift to interglacial values was systematically younger for cores collected at higher elevations, with the shallowest core recording a time of 132,2200 ± 1,500 years ago for the midpoint of the shift to interglacial values, as compared with a value of 142,000 ± 3,000 years ago for the deepest sample for which TII data had been reported. The duration of the last interglacial delta-oxygen-18 peak as recorded in the samples was also found to shift systematically with sample elevation. A duration of 16,100 years for the last interglacial peak was measured in a higher elevation core as compared to a duration of ~22,000 years in a deeper core. The authors argue that because of the systematic shift in values with elevation the chronology of the shallowest core is closest to the true age. Timing of TII and the last interglacial. (A) DH-2 dark green (this study) and DH-11 light green. (B) DH2-D dark blue (this study) and DH2-E mid-blue (this study). (C) Great Basin composite dripstone pink; Lehman Cave red and dark red; and 65°N July insolation (gray). The midpoints of transitions are indicated with x’s and vertical dashed lines. The age of the TII delta-oxygen-18 midpoint vs depth below the water table for different cores - DH-11 light green, DH-2 dark green (this study), DH2-E mid blue (this study), and DH2-D dark blue (this study). With this correction, the highest elevation core delta-oxygen-18 shift to interglacial values was found to coincide with the rise in northern summer insolation as predicted by the orbital forcing hypothesis. It was concluded that the timing of TII and the duration of the last interglacial delta-oxygen-18 peak in the calcite record are both consistent with orbital forcing. In the most recent calcite core record there is a prominent low in delta-carbon-13 (a proxy for primary productivity) at the end of TII. The recent results move this to younger values by about 7,000 years relative to the previous cores. As a result it was found to coincide with the northern summer insolation peak. Because this would likely be a time of warmth and high warm-season rainfall locally, the new timing suggests that the delta-carbon-13 low was caused by the presence of more extensive vegetation cover and productivity. The new chronologies from Devils Hole have identified a systematic offset in the age of calcite deposited at increasing depths in these open fractures at Devils Hole, thus helping to resolve one of the great paleoclimate enigmas of the past three decades. M.Milankovitch, Kanon der Erdbestrahlung und seine Anwendung auf das Eiszeieen-problem, Special Publication 132, R. Serbian Academy Belgrade 1941.